‘Balance Point’ theme of photography, abstract art and sculpted works at Link Gallery. A little dancing dress, the beauty of movement in mid-leap and the rhythm of abstract art are combined in a show to celebrate Dayton Contemporary Dance Company’s 40th anniversary at the Link Gallery in the Oregon Arts District. Amazing photography by Andy Snow, the abstract meanderings of Terry Hitt and sculptured works by Tess Little are choreographed together to enhance the “Balance Point” theme. “The artists all made such wonderful correlations between the dance form and the visual art form. Dance, sculpture, photographs, any kind of art form, even literature and music — all has to have that point of balance and rhythm flow,” said Kaye Carlile, gallery co-owner. Snow is presenting 10 images of Dayton Contemporary Dance Company choreography. He captures the joy of dancers caught in mid-leap, in total synchronocity with another dancer, or as an explosive unit. In “Las Des,” a 24-by-36-inch color archival print, two upper torsos appear to be reaching out from one set of legs. For “Leap of Faith,” he records with split-second timing the apex of a jump. Snow began his love for dance photography when he shot images of Dayton Ballet dancers in their Victoria Theatre studio in 1983. Since then, he’s incorporated images of contemporary dance moves within DCDC. For “Naturally Spring Fantastic,” a large-scale oil, he seamlessly incorporates dancing forms in an undulating landscape ground. Hitt also mimics ancient drawings of brightly-hued stick figures that dance across the canvas. 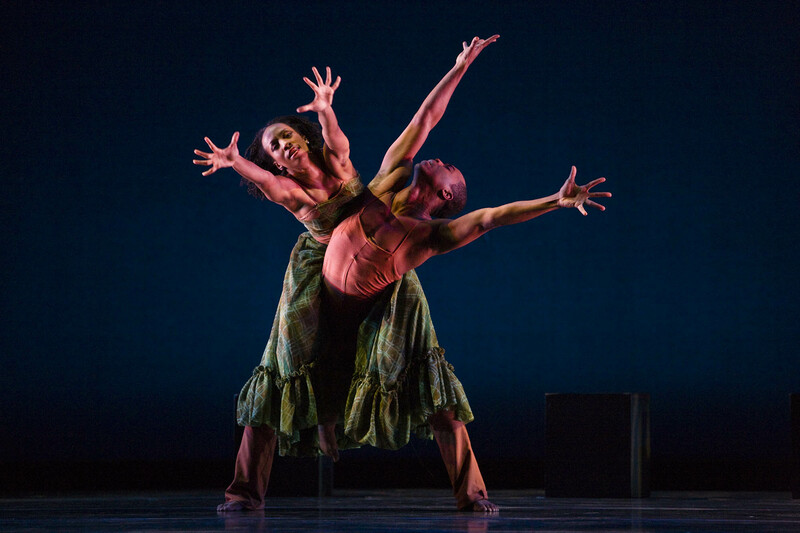 “I may never be an accomplished dancer, but I dance on the page to celebrate life,” Hitt said. And last, but certainly not least, are the sculpted works of Tess Little. It’s a joy to experience her works up close and personal, everything from her sassy bronze “Little Black Dress” to a vision of her husband and grandson “On Top of the World,” a clay globe with bronze playful figures. Most everyone has seen her “Healing Circle” of women holding hands in a show of solidarity. A newer work is also mesmerizing. “Swept Away” is a bronze and steel work also created in a circular pattern. High on a pedestal, the focal female figure flies with the wind. “Dancing and sculpture have much in common. They both move through space in exciting ways, stirring the soul and creating compositions that sing the song of life,” Little said. Where: Link Gallery, 519 E. Fifth St. This entry was posted on Thursday, October 30th, 2008 at 7:43 pm	and is filed under dayton rocks!. You can follow any responses to this entry through the RSS 2.0 feed.